How do we ensure that our teams are up for the challenge? With Maxine. Scenario-based training with Maxine “We have access to a simulation mannequin, or Maxine as we fondly refer to her, through our partners at Health Ventures Alliance in Erie. 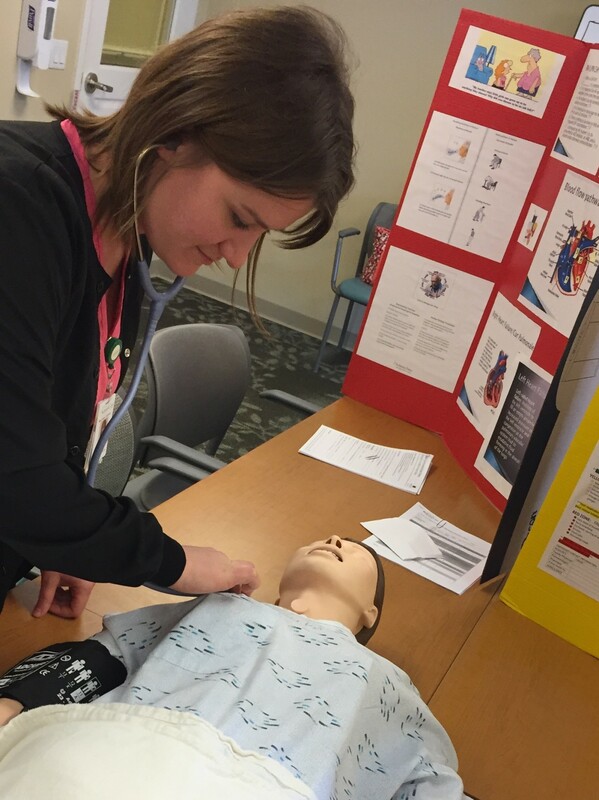 The simulator allows our nurse educators to set-up scenarios for our teams so that they can comfortably work through assessing a resident,” says Kristen Moore, care transition educator for our Erie campuses. While the team member is assessing Maxine, the mannequin has the capability to respond to what the team member is doing for treatment. So the “patient” changes as the scenario moves forward. Photo caption: Megan Smith, LPN, practices recognizing lung sounds. “Maxine helps our clinical team members learn how to identify changes and seek interventions earlier in the treatment process. They also learn how to stabilize a patient, which in a real-life scenario, could ultimately avoid transfer to the hospital,” says Kristen. The simulation mannequin provides training on a variety of topics, including how to recognize normal and abnormal breath sounds and heart sounds, IV placement, blood draws, urinary catheterization, wound identification and care, injections, tracheotomy care, blood pressure checks and more. Another benefit of the simulator is that it offers special programming for common illnesses such as pneumonia and heart failure. “What’s great about Maxine is that she was built to have all of the common diagnoses that we see in our communities. If we find that at any given time, there are a number of residents in our care that have congestive heart failure (CHF), we are able to hold a special education session with our teams to discuss CHF, and then we program Maxine so that they can practice the proper treatments,” says Ginny. The simulation lab was created at Manchester Commons, one of our campuses in Erie, after Ginny attended a presentation where the labs were discussed. At the end of the conference, she was so inspired, she drew the Simulation Lab on a piece of paper while waiting to catch her plane home. Her dream turned into reality shortly after, and the simulation lab was set-up like a typical resident room. 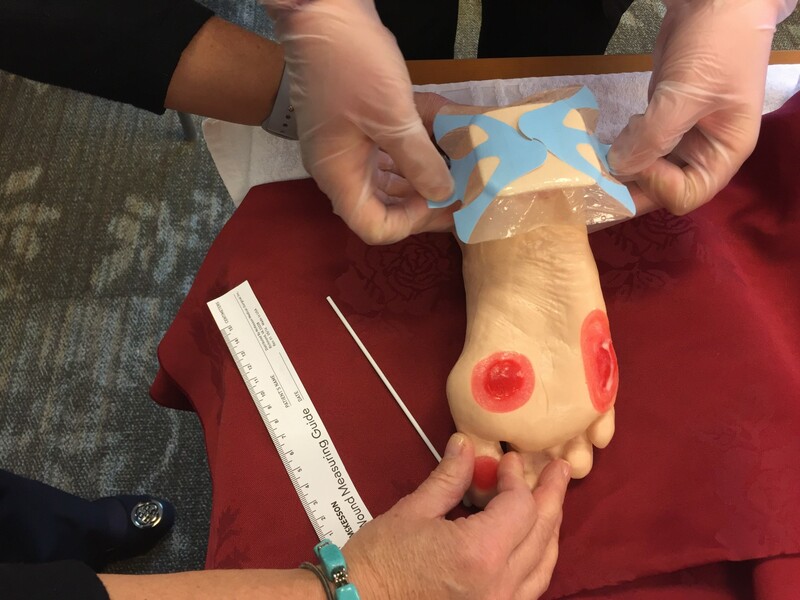 When Maxine isn’t on campus for training, team members are still able to practice on the variety of simulated body parts that have been purchased for training purposes; they are able to practice clinical techniques on a foot, an arm, a leg and more. How often do we train? As part of orientation, newly hired Certified Nurses Aides (CNAs) and nurses participate in the Simulation Lab training to show that they are able to complete basic competency skills. Current nursing team members complete the training once a year as a refresher. Photo caption: Team members practice proper wound dressing. “I have to admit, when we first started training with Maxine, it felt a little silly and awkward because she’s a mannequin. But those feelings quickly disappeared after a number of team members went through the training and thanked me for a refresher that they felt was needed. I cannot believe how many team members have told me ‘Wow, I learned how to do that procedure more efficiently,’ and ‘the lab was wonderful, can you believe I forgot how to take a manual blood pressure!’ But what gets me the most is when a team member tells me thank you and that they appreciated the time I took to show them how to do a particular procedure. That is what it’s all about – we are all in this together,” says Kristen. If you are interested in learning more about donating towards the purchase of a simulator, please contact the Foundation office at 412-826-6195 or email foundation@srcare.org. Meet Brianna Larrow, a team member who benefited from the CNA Training Classes at our Oakmont campus. Learn more about her journey to becoming a CNA. Q: How long have you worked at Presbyterian SeniorCare Network? A: I’ve worked at the Oakmont campus for about three years, working first in dining services as a hospitality aide, and now as a CNA. Q: You decided to transition from the dining department to working as a CNA. Why? A: While I worked in dining, I often received encouragement from residents and coworkers to take the CNA classes. I took their kind words to heart and eventually enrolled! I did not have caregiving experience, so I saw the CNA training classes as more than just a way to advance my career and increase my knowledge, I saw it as an opportunity to do what I love – care for others. Q: Did you find the class helpful in learning how to do the daily work of a CNA? A: Yes. The CNA training classes taught me and my classmates the skills required to work in long-term care. I really feel that the classes taught me everything I needed to know so that I could perform my daily duties and responsibilities. I learned that I would be the eyes and ears in the skilled nursing neighborhood which made me feel like what I was training for was both needed and meaningful. Q: In order to become a CNA, you need to pass a State test. Were you prepared? A: I felt extremely prepared for the test after taking the class. Mindy (instructor) teaches us everything we need to know, going over all the material multiple times not only before the exam, but before we even step out on the floor with the residents. The clinical portion just reinforces everything we learn with Mindy in the classroom. By the time we took the test, the material is second nature. Q: What did you enjoy most about the class? A: I loved the clinical portion and gaining firsthand experience with the residents. I loved seeing how things worked as part of the clinical team and helping out, especially because I’m a hands-on learner. Because of my previous work in dining services, I already knew the residents well, and now I was able to work more closely with them, which was and still is so rewarding. Q: As a CNA, what are some of your main responsibilities? A: I take care of our residents, make sure they are comfortable and without pain. I help them with daily activities and observe any changes in condition, which I report to the nurse manager. I also keep them motivated and hope to make them smile! Q: What would you say to anyone thinking about pursuing certification to become a CNA? A: There is always a need for CNAs. If you love taking care of people and seeing them smile, consider becoming a CNA! Sometimes the job is hard, but in the end, it’s not about difficult duties, it’s about helping to make our residents feel important and cared for at this stage in their lives. Interested in becoming a CNA like Brianna? Visit CareersAtSrCare.org to explore your options around our Network! People looking for jobs in their 50s or 60s who haven’t been job hunters in years — maybe decades — often tell me they find the process frustrating. They apply for posted jobs and never hear back — the “black hole” syndrome. Steve Dalton, program director for daytime career services at Duke University’s Fuqua School of Business and author of The 2-Hour Job Search: Using Technology to Get The Right Job Faster sympathizes, but also has important advice: You need to know how to look for work in this age of virtual job search. After reading The 2-Hour Job Search, I interviewed Dalton to hear more; below you’ll see my eight favorite tips he offered. Now about that “2-hour” notion: In reality, the two hours are not how long it will actually take you to get hired, but the time it will take to winnow down your list of 40 potential employers and finding networking connections who can be your insider booster or advocate. That’s a person who can bring your resumé to the right person, make an introduction and help you get an interview. “In practice, you start with forty employers that you rank in terms of priority, but no job seeker I have worked with who has followed the two-hour search has ever gotten past fifteen without getting hired,” Dalton says. Dalton’s people-centric approach hits me as particularly wise with the news this week that the Federal Trade Commission (FTC) charged two companies with bilking hundreds of thousands of dollars annually from consumers for sham job placement and resumé repair services. To get an interview, job seekers had to pay upfront fees of $1,200 to $2,500. In many instances, the defendants pocketed consumers’ money knowing the job opportunities were fake, according to the FTC. A federal court halted the scheme and froze the defendants’ assets at the FTC’s request. Don’t be embarrassed. “There’s a lot of needless embarrassment and shame associated with job searching mid- or late-career, when nobody at that age has been rigorously taught how to job search, particularly in the online job posting era. Don’t be ashamed. Embrace this as a new skill set — turning strangers into advocates on demand,” says Dalton. Get contacts at your prospective employers to talk about why they are so good at their work. “Set up an informational interview. This can take some persistence. Find people whose work you admire, preferably at companies where you want to work, and reach out by phone or in person to learn about their jobs,” says Dalton. During these conversations, resist the temptation to sell yourself. “It is the sell-yourself mentality that sends the conversations off the rails. Focus on really learning. When you embrace the humbling process of no longer selling yourself and instead dedicate yourself to listening, you will get so far, so quickly,” says Dalton. Hone your listening skills. “When I give my talks, I show the audience a GIF of dog cuddling up to its owner because dogs are experts at this. When they look at their owner, there is not another person in that dog’s world. They block everyone out. They are singularly focused. We don’t love dogs because they are good conversationalists. We love them because we are the only person in their world when they look at us. That is the key to listening well,” says Dalton. Be likeable. “The point is not to tell them why you are so great. The point is to let them know that they have been heard. That you are open to learning and are passionate about learning about their employer or the work they do. You are perceived to be likeable if you are listening. It’s how you build a booster relationship. It is counterintuitive concept,” says Dalton. Take advantage of LinkedIn. “I don’t endorse a lot of career -related websites, but I do consider LinkedIn a must. Even better, it’s free [if you don’t sign up for the premium version]. A LinkedIn People Search helps find contacts at a target employer. It’s six degrees of separation. You supply the name of employer and it shows the closest connection you have to someone who works there. If it’s someone who shares an alumni connection with you, even better. LinkedIn Groups are also helpful to find connections, or people to reach out to with a short, fewer than one-hundred words, email that has no mention of a job, just your connection to him or her and expressing an interest in learning about a topic,” says Dalton. Use job boards for research. “Online job postings aren’t good for getting you a job, but they’re great information about what sorts of jobs are available in a particular city. I recommend using Indeed for meta information; what employers are looking for in your city, even different jobs than what you’re looking for. I always figure the specific jobs listed are already spoken for. The chance of a random applicant online going through and getting that job is a longshot. Remember, you are looking for people. I have never heard of a job seeker finding a job online who didn’t have a booster,” says Dalton. Don’t fear technology. “The good news there is really no intimidating technology anyone has to learn to pull this off. Use a simple spreadsheet to create your list of employers; LinkedIn and Google searches to learn about trends in the industry that interests you and to discover smaller companies in the field doing interesting things that you may not have known. You may also tap into databases such as an alumni one or Dun & Bradstreet’s Hoovers to learn about competitors of companies you’re interested in that may tip you off to less obvious employers. Back in the old days it was accidental networking; you meet or know somebody who knows somebody. Now the game is about having those accidental meetings, but on purpose. That is terrifying, but not a lot of new technology to learn,” says Dalton. Longwood at Oakmont residents care deeply about the community in which they live and are remarkably involved in life at Longwood through 40-some active volunteer-led committees. A number of those focus a keen eye on their surroundings to ensure everything stays in top shape through leading beautification projects around campus. When members of the Bench Committee noticed that one of the garden areas, The Memorial Garden, created in 1999 by residents Paul and Elizabeth Lyle, needed tending, they reached out to Paul Peterson, senior director of the campus, for help. No one guessed that simple request for help would bloom into a wonderful partnership between Longwood residents and the Garden Club of Allegheny County (GCAC), a renowned area garden club. Paul asked resident Margot Woodwell to lead the revitalization efforts. Margot, who is also a member of the GCAC, graciously volunteered her time and set forth to reconstitute the memorial garden committee to coordinate the project. All the committee had gardening as a hobby, and some were members of the GCAC. Knowing the revitalization effort would require a special set of skills, as well as the willingness to volunteer time to the design and execution of the project, the group decided to see if the GCAC could lend their time, talent, and resources to collaborate with the committee to revitalize the Memorial Garden. When approached, the GCAC heartily accepted. When the Longwood residents and the GCAC first met, it was apparent that their joint passion for gardening would recreate a beautiful space at Longwood. “I had so much fun discussing what plants, shrubs and trees would be appropriate for the garden. The Committee was so enthusiastic and had great suggestions. Everyone had a hand in researching the variety of plants for consideration,” says Delia. “Gardening is a creative activity and we saw our plans come to life on planting day,” said Mernie Berger, a member of the Memorial Garden Committee. On planting day, several Longwood at Oakmont residents and 35 members of the GCAC spent almost 3 hours bringing the Memorial Garden design to fruition. “It was so wonderful to see our GCAC members, gardening gloves and trowels in tow, ready to dig in…pun intended,” laughs Delia. After everything was complete, there was not one face without a smile; everyone was delighted with the result. It is amazing what a group of volunteers can do with a bit of enthusiasm, dedication…and dirt! “Now that the Memorial Garden is back in top shape, I hope that residents and their families will use the garden, and even consider making a contribution to help with the upkeep,” says Margot. The garden will be maintained by the landscaping company that Longwood contracts with, and the Memorial Garden Committee will be keeping a close eye on the plants, ensuring they are blooming for years to come. Through the volunteer efforts of the Longwood residents and the GCAC, the Memorial Garden has reclaimed Paul and Elizabeth’s original vision: a place where residents could go to remember those who had passed. “The Memorial Garden, fittingly, has a beautifully serene atmosphere about it. I hope everyone is able to take advantage of the setting and occasionally stop and sit in the gazebo and pause to reflect on dear friends who have touched their lives but are no longer present on this earth,” says Delia. It’s Time to Start Clowning Around! Joyce Retort worked at Shenango on the Green, a Presbyterian SeniorCare Network community, for more than 12 years. Soon after “retiring,” Joyce returned to campus, bringing her talents as…a clown! Joyce has been clowning for several years. Knowing the joy that a red nose and goofy glasses brings to a crowd, she decided to have a bit of fun at her former place of employment. What Joyce didn’t count on was making a special connection with resident Dr. Paul Griffin. Dr. Paul is an experienced clown; he’s done a bit of clowning himself with the Shriners as “Griffie” the clown. When Joyce visits, Dr. Paul lends his clowning advice and really gets a kick out of the fun that Joyce brings to campus, especially when she’s making balloon animals. When Joyce isn’t clowning around campus, she contributes other talents like crafting and baking, and can often be found in one of the neighborhoods with a group of residents. Thank you, Joyce, for being an invaluable member of our team, enhancing the lives of our residents! If you are interested in learning more about volunteer opportunities at Shenango on the Green, please click here. Puppies, Chicks and Owls, Oh My! Many of our residents volunteer their time - like our residents at Oakwood Heights, our campus in Oil City. Read on! Our residents are very civic-minded, and when they are able to put smiles on the faces of those in the community, they do! A great example of outreach is through the partnership with the Community Services of Venango County. Residents at Oakwood Heights donate their time to make washcloth animals to place in welcome baskets that are given to new babies born in the county. “Residents make everything from puppies to chicks to owls,” says Carrie Karns, lifestyle engagement director at Oakwood Heights. “Once the cute little washcloth animals are made, they get placed in baskets that are then delivered by volunteers at the local organization Welcome Every Child. We handcrafted over 60 animals and donated them to Welcome Every Child last year. The residents were so proud of their creations and contribution to the program,” Carrie says. Giving back to the community helps to reinforce our resident’s sense of purpose. Thanks to the partnership with Welcome Every Child, our residents were able to give back to their community. If you are interested in learning more about volunteer opportunities across Presbyterian SeniorCare Network, please click here. When I think back, over 35 years ago when I first came for my interview right out of business school, I think…WOW! Where did the time go? It has been quite the journey. At 18 years of age, my first interview here was to be an Assistant to the President’s Secretary. At that time, it was a small place and I met EVERYONE on my first day. Thinking about that and the evolution of the company, there are so many people now I still haven’t met. Presbyterian Association on Aging (the “old” name) has certainly changed in leaps and bounds. This was my very first interview out of Bradford Business School and I couldn’t believe how lucky I was to work for this company practically in my back yard! Through the years, I worked my way around the company from Assistant to the Secretary; to Secretary to the newly created “Senior Housing Services” (now known as SeniorCare Network); to working in the Medical Center (The Willows) as a Unit Secretary; then lucky enough to be asked to come back to the Housing Division to work with Jim Pieffer. It’s been quite a journey with many, many offices. My kids grew up here. My daughter, Madeline, was the first kiddo in The Strawberry Patch, the daycare I helped start here on campus. Then my son, Orazio, came here, too. I loved that! I was able to visit my kiddos for lunch and story time. It allowed me to still work but know that I didn’t have to worry about them – I got to see them during my day. They would even yell at the Hamilton House window for me to come and play… and yes… I was known to take a turn in the bouncy house when they had their parties behind the Hamilton House (not sure Jim knows that but he does now lol. My kids are now in their 20’s – hard to believe! I’ve seen beautiful residents come and go… my absolute favorite was Jim’s godmother, Loretta. She’d call for “Jimmy” and get me to come over to see her. I enjoyed every minute with her – she was a beautiful, beautiful soul and I still think of her today. Believing in this company’s mission has kept me here for all these years. I’ve had family members in our system, and I wouldn’t have wanted them anywhere else. The care here is exceptional and I’m always proud to recommend Presbyterian SeniorCare Network. As in all jobs there are struggles, but working with a so many great team members, I honestly can’t imagine working anywhere else! Explore our careers at CareersAtSrCare.org! When’s the best time to start thinking about long-term care? You may or may not need long-term care. But an unexpected illness or injury can change your needs—sometimes suddenly. The best time to think about long-term care is before you need it. Long-term care is a range of services and supports older adults may need to meet their personal care requirements. Most long-term care is not medical care but rather assistance with activities of daily living (ADLs), such as bathing, dressing, eating and bathroom tasks and supportive services, such as taking medication, doing housework, shopping and preparing and cleaning up after meals. The best time to start planning for the possibility of long-term care is before you need it, and no time is better than the present. Consider this: According to the U.S. Department of Health and Human Services, almost 10 million people currently need some form of long-term care in our country. Of this population, 63 percent are over the age of 65 and 37 percent are under 65. Although one-third of today’s 65-year-olds may never need long-term care, one-fifth of them will need it for longer than five years—and women, on average, need care longer than men. But although most seniors will need long-term care, many have not yet thought about what they may need and fewer still have a good understanding of how they’ll pay for it. Consumer surveys show misconceptions on what Medicare will pay for. Fully 25 percent of people said they’d let Medicare pay for their long-term care—a major problem since, in the vast majority of cases, Medicare does not pay for long-term care costs. The website longtermcare.gov explains that Medicare only pays for long-term care if you need skilled nursing or rehabilitation in a nursing home, for a maximum of 100 days (although the average Medicare-covered stay is 22 days) or at home if you are also receiving skilled home health or other skilled in-home services, and usually only for a short period of time. Medicare does not pay for non-skilled assistance with ADLs, which make up the majority of long-term care services; so if you do not have a private insurance program in addition to Medicare, you will have bear the expense of these services yourself. Medicaid, the nation’s health program for the low-income and disabled, will pay for long-term care but it requires seniors to spend nearly all of their assets beforehand. These days, nearly half of all long-term care in the United States is paid for by Medicaid—a huge burden that is only going to grow as millions of baby boomers reach their 80s. Clearly, thinking ahead about the type of long-term care you might need and putting a plan in place early on is important for both you and your family members. And people with Alzheimer’s disease or other cognitive impairment should begin their planning as soon as possible. Planning for the possibility of long-term care gives you time to learn about the services available in your community and what they cost. And it helps you to consider all your options so you can make informed decisions on such things as housing, medical care, legal documentation and finances while you are still able. 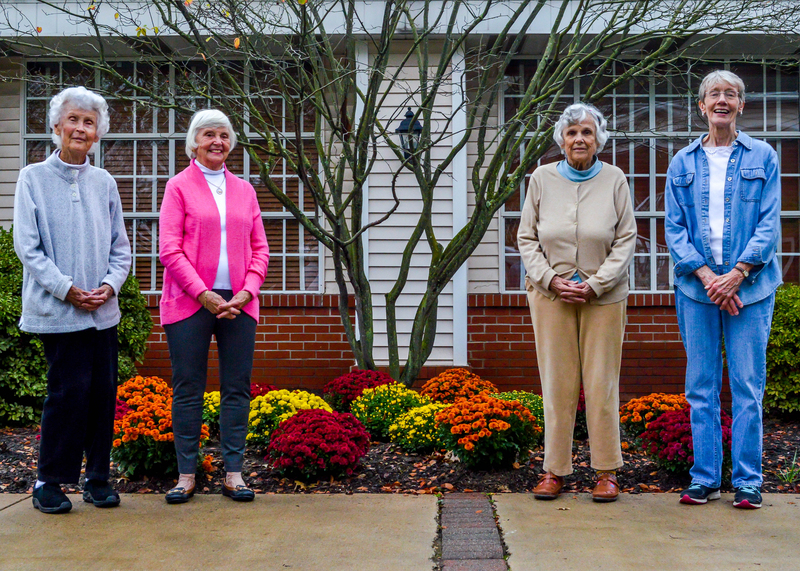 One innovative long-term care planning option offered by Presbyterian SeniorCare is called Longwood at Home.™ Licensed by the PA Department of Insurance, Longwood at Home offers services for healthy older adults that help them stay in their own homes and age in place. Longwood at Home provides adults ages 60 and up the opportunity for a lifetime of continuing care without giving up the comfort of—or investment in—their homes. Members are offered care coordination, wellness programs, medical transportation, social events and asset protection, as well as the assurance that a total package of long-term care services—from private duty to nursing facility care—will be available to them if needed, at a fraction of the cost of paying for the services privately. With Longwood at Home, seniors get the peace-of-mind of knowing that the services and care they may need will be there when they need it, while remaining at home for as long as possible. For more information, visit www.longwoodathome.org. Tiza Riley’s client has spinal stenosis, severe osteoporosis and a rotator cuff injury that was never repaired. Still, at 82, her client has never felt better. She does Pilates (pronounced pih-LA-tays), the increasingly popular exercise system for women and men. Like driving to Palm Springs twice a year to see her son — without back pain. And gardening four days a week. During their sessions, Riley works on her client’s core stability on a floor mat, then moves to a piece of Pilates equipment called the Reformer to strengthen her client’s feet and legs. Core strength and stability are at the center of Pilates, which works the whole body to improve posture, balance, flexibility and strength. The core, Riley explains, is comprised of the pelvic floor, transverse abdominis, diaphragm and multifidi along the spine, which, when properly engaged, work together to create the effect of a nice snug corset. Originally from Mönchengladbach, Germany, Pilates developed the exercise system during World War I, while he was being held at the Knockaloe internment camp on the Isle of Man. He developed a series of floor exercises on a mat that engage and strengthen the core, stabilize the pelvis, strengthen the arms and legs and lengthen and mobilize the spine. He also developed the strap-and-pulley system into equipment designed to help accelerate the process of stretching, strengthening, body alignment and increased core strength started by the mat work. The Reformer is the best-known and most popular of this equipment; it “includes a moving platform that inherently challenges stability and balance,” Riley says. The Reformer also supports the body during Pilates. The benefits of Pilates are not only physical, but mental. “The Reformer gives the body more input and feedback that the nervous and neurological systems need to wake up and become active,” says Cari Riis Stemmler, owner and master teacher at Paragon Pilates & Physical Therapy in Edina, Minn.
Other benefits from a regular Pilates practice include arm and leg strength, balanced muscle development, injury prevention and “increased energy and joy for your activities,” Riis Stemmler says. Runners, golfers, swimmers, runners, dancers and horseback riders all benefit from Pilates — so do people who aren’t as fit, or who come to Pilates with injuries or a chronic disease. An acute injury should always be treated by a physician, then followed up with physical therapy. After that, Pilates can help with further rehabilitation and strength building. Today, Pilates is taught and practiced in a variety of styles, from the classical method Joseph Pilates devised to more contemporary iterations, including Stott Pilates, Balanced Body, Peak Pilates and even a new franchise on the scene: Club Pilates. To find the right teacher, start by visiting the website of the Pilates Method Alliance (PMA), the nonprofit professional association dedicated to the field, and search the directory for an instructor in your area. Check out instructors’ certifications: In which style or program are they comprehensively certified, meaning, they can teach on all of the Pilates equipment? How many years of experience do they have? Talk to friends and colleagues about instructors they like or who have helped them. When calling or emailing Pilates studios for information, advocate for yourself: Which instructors have experience with your concern, whether it’s a disk or joint injury, back issue or just wanting to improve your core strength and spine flexibility in a safe way? “If they say, ‘Oh, yes, we do that,’ and it feels more like a sales pitch than a conversation, you might want to look elsewhere,” advises Riis Stemmler. If you have osteoporosis, many of the Pilates exercises are “contra-indicated,” meaning they could cause more harm than good. An instructor certified in a program like Rebekah Rotstein’s Buff Bones might be the ticket, as it combines bone-strengthening techniques with alignment and balance exercises. Ask if the studio also offers physical therapy, or receives referrals from physical therapists, which is an indication that the trainers can provide you with additional resources or instruction in addressing your physical concerns. Finally, finding an instructor who feels right, someone who you can trust and connect with, is essential. Moreover, after taking a class, “Trust how your body feels. When you’re done with your workout, you should feel good. Worked, but supported and stronger,” Riley says. When practiced safely and correctly, with an expert instructor, Pilates “is perfect form of exercise for people even into their 90s,” adds Riis Stemmler. Camille LeFevre is a professional freelance writer and Balanced Body® certified Pilates mat instructor.